Coastal rail service will be suspended in both directions from Oceanside to San Diego for the second weekend in a row for track, station and bridge improvements. 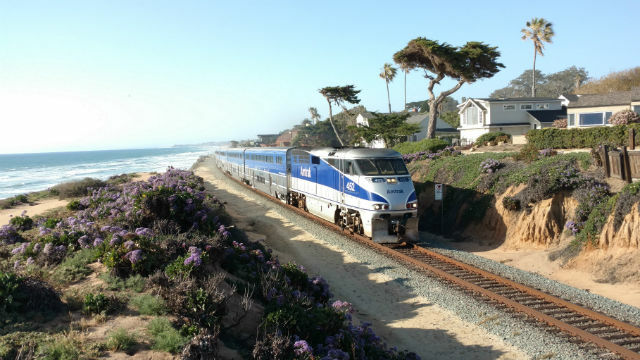 The scheduled rail work in Carlsbad and San Diego will affect weekend rail service by North County Transit District, Metrolink, Amtrak and the BNSF freight line. Rail service is expected to resume Monday for morning commute hours with possible delays. Crews in Carlsbad will shift the existing western rail line toward the route’s new western platform at Poinsettia Station while removing the old platform. The $33.7 million station improvement project will lengthen and elevate passenger platforms, install a fence between the tracks and replace at-grade rail crossings with an undercrossing, according to the San Diego Association of Governments. The agency expects the work to be completed in 2020. In San Diego, crews will install new signage and drainage systems and remove graffiti. The work is part of the ongoing Mid-Coast Trolley project, which will extend Metropolitan Transit System Blue Line service 11 miles from Santa Fe Depot in downtown San Diego to University City. SANDAG expects the $2.17 billion extension to be completed in 2021. Crews will also continue bridge construction work near Friars Road by installing temporary metal support structures that will hold the bridge in place until it’s completed.